→Snagoo Review – Is It a Scam? Does it Pay 50 – 100% More? Snagoo Review – Is It a Scam? Does it Pay 50 – 100% More? Snagoo claims to be a GPT site where you can earn 50 – 100% more than other well-established platforms. I have never heard about Snagoo until I discovered someone promoting it on a Reddit thread. So, is Snagoo a scam or legit site? Can you really earn more than the other popular GPT sites? Snagoo is a brand new (2018) GPT site that allows you to earn money by taking surveys, completing offers and watching videos. The platform is owned and operated by Symonds Media LLC, an American company headquartered in Wyoming. According to the Terms of service, it’s currently only for U.S. residents. If you live outside the U.S., a great alternative to Snagoo is Prizerebel – My Top rated GPT. However, you should always be careful and redeem points as soon as you reach the minimum threshold. Don’t accumulate large amounts as you never know. It`s likely that Snagoo pays more than other popular GPT sites. There are lots of offers and survey opportunities. Earn login bonuses and extra points for achieving higher reputation levels. Like all GPT sites, the income potential is not that great! There is a PayPal fee of 25 points. It`s still only available for U.S. residents. Simply sign up using your name, and email address. Then, you receive an email confirmation and a link to create your password. Finally, choose a password and log in. 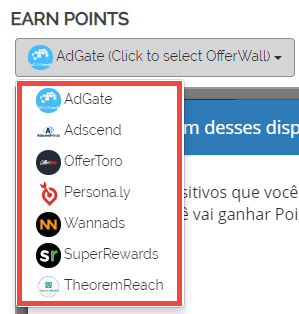 Snagoo has partnered with 7 offer walls, which are basically third-party platforms that provide paid offers, videos, and mini tasks. These are the same offer walls you will find in other GPT sites like Prizerebel and InstaGC. They have also partnered with marketing research companies to invite you to participate in online surveys. One of these companies is Pollfish. Whenever you complete an offer, task or survey, you will earn points that you can trade for various gift cards as well as PayPal cash. 100 points have a dollar value of $1. However, if you decide to redeem via PayPal, 25 points will be deducted as a fee. All the available online surveys can be found in the lower left corner of the screen as well as in some offer walls. 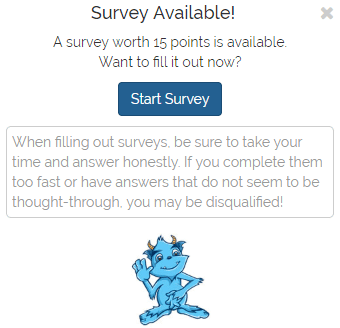 Most surveys pay less than 100 points ($1), and it’s not uncommon to be rejected in the pre-qualification process. All offers can be found within each offer wall. You can find free offers such as entries for prize draws, website signups, app downloads, and free trials, as well as paid offers that require a deposit. Pay close attention to the terms and conditions of each offer as you must follow the rules strictly. Sometimes the trial is not actually free as you are required to pay for the first month of subscription to earn the points. You can invite other people to join Snagoo and earn 10%, 15% and 20% of the points that each of you referral earns by taking surveys and completing offers. The commission rate depends on your reputation level. To get referrals, simply share your referral link on any of your social media accounts. A great way to get lots of referrals is by creating a blog and promoting Snagoo. You will earn 5 points as a login bonus if you complete any offer during the previous day. This encourages users to come back to Snagoo more frequently. Snagoo has an interesting reputation system that rewards users with up to 15% more points for each offer or survey. Also, the higher your reputation, the more referral commissions you will earn among other great benefits! Your reputation improves the more surveys and offers you complete and decreases whenever you get chargebacks or survey penalties. Can You Earn More Than Other GPT Sites? It’s difficult to confirm the claim that Snagoo pays, on average, 50 – 100% more than any other GPT site. 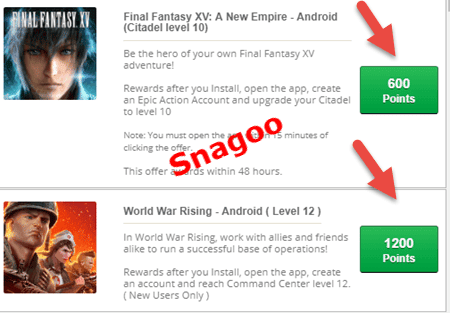 I decided to put some the same offers on Prizerebel side by side and discovered that indeed, Snagoo was paying more! Not to mention you can earn 5 points extra as a login bonus, and more points if you have a higher reputation. Although I can’t confirm such claim, I believe Snagoo is going the extra mile to pay you more than its competitors. In my opinion, Snagoo has all the ingredients to be one of the best GPT sites out there. It’s a brand new and legit platform that should get more traction in 2019. The only big issue is that it’s only available in the U.S. at the moment. In 2015, I discovered affiliate marketing and the possibility to work from home and live life on my own terms. Thanks to this excellent training program, I learned how to set up a WordPress site, attract a huge audience, and make money by promoting other people`s products. There are no limits to how much money I can make as the revenue depends on how many people I attract to my site. One of the best things about owning a website is that I am can work whenever and wherever I want. Plus, I make passive income! For example, in August made $1,000 even though I was traveling around Europe for 1 month. I joined this program as a complete beginner, and it was life-changing! It’s indeed an amazing opportunity to build an online asset, but it only works if you consistently apply the strategies and give your business enough time to grow. Yes, it’s a real business that needs to be cultivated. Thanks for checking out my Snagoo review. If you have any question, please let me know in the comment section below.